You centre, technology at your side. This is our advice blueprint. A professional guide who listens to your goals. And intelligent technology that works with you to plan your strategy easily and cost efficiently. Your advisor is ready to listen to your needs and find the right investment choices for you. We have built state of the art software that constantly monitors your portfolio. Talk to your advisor online or with our app, safely and in your own time. No hidden costs and graphic reporting that illustrates in full detail how your investments are progressing. Your financial future is not just a question of numbers. The person behind the figures is important for us. Life is full of questions. Our Personal Financial Advisors can help you find the right answers to plan your goals and look to the future with confidence.Whatever your needs, we will always be by your side. With risk monitoring and investment diversification you can seize the opportunities offered by a changing market. With our insurance solutions you can protect part of your capital, without sacrificing your returns. We build targeted strategies to help you realise your projects calmly and soundly. Even those most ambitious. We help you plan your investments to keep your lifestyle even in retirement and look calm to the future. Predicting the future is impossible. But we can help you carry through with unpredictable events. We support you to get efficient tax solutions and to pass down your assets to your loved ones. Fineco is one of the leading FinTech banks in Europe. Since 1999 we have been investing in technology to provide our consultants with the tools to offer you investment solutions that are truly tailored to your needs. We will help you manage your assets and investments in a holistic way. Your Fineco advisor can take care of your financial and future well-being, helping you build a peaceful future. Your Personal Financial Advisor can offer you Fineco Advice– our personalised advisory service for high-wealth clients, able to satisfy many needs: from succession planning to tax efficiency. With the help of state of the art technology, your Personal Financial Advisor can help you find investments tailor made for you, that fit you and your goals. You can choose multi-asset products, including not only multi-brand funds, but also securities, bonds, ETFs. Achieve your goals in 5 steps with Fineco's advanced advice services. Contact us to set up an introductory meeting with a Personal Financial Advisor in a Fineco Center. Together with your advisor, identify your objectives, define your priorities and decide on your time frame to achieve them. With our cutting edge software, the Personal Financial Advisor can analyse your current portfolio and evaluate its overall quality. Your consultant will offer you a personalised investment plan, explaining the strategy, tools and the level of risk/return in detail. Your Personal Financial Advisor will constantly monitor and use real-time alerts to check how your portfolio evolves. So you can be sure you are always on the right path. Monitoring the performance of your investments compared to the defined objectives. Instant notification in the event of significant market changes. When necessary, your portfolio will be periodically recalibrated. Fineco Asset Management is the savings management company under Irish law, wholly owned by FinecoBank. It puts together outstanding products that can add more value to your investments using the finest skills available on the market. Some people call it Private Banking. For us, it’s your future. Fineco is the most used multichannel direct bank in Europe for investments and one of the most solid companies in Italy (CET1 21.16%). Almost 1.3 million customers trust Fineco with their savings: with total assets of €69.3 billion, €25.8 billion in the Private Banking segment. If you are looking for a financial solution to simplify and improve your life, contact us for advice in the strictest confidence. Fineco Advice: is a fee-based investment advisory service reserved to Fineco current account holders. It is promoted and can be purchased exclusively through the Fineco Financial Advisors network, where the terms and conditions of the service can be found. The advisory service does not in any way entail any promise or warranty regarding financial returns. Accordingly, the Bank accepts no liability for any losses of any kind borne by the client or for earnings that are lower than expected. 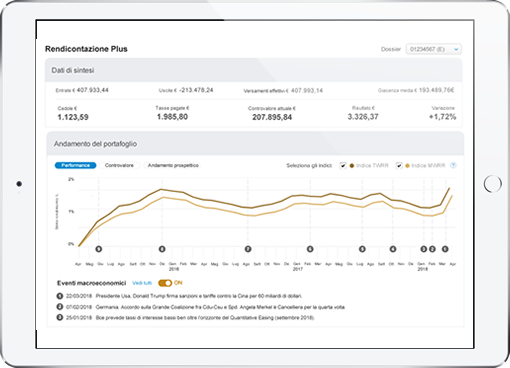 Per tutte le condizioni relative ai prodotti e servizi pubblicizzati occorre fare riferimento ai fogli informativi e alla documentazione informativa prescritta dalla normativa vigente, disponibili anche presso i consulenti finanziari della Banca. Tutti i prodotti e servizi offerti presuppongono l'apertura di un conto corrente Fineco.